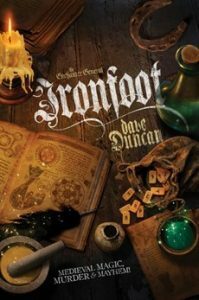 I borrowed a copy of Ironfoot, by Dave Duncan, from my local library. It is 1164, and for a hundred years England has been ruled by the Normans. A young Saxon boy named Durwin, crippled by a childhood accident, had caught the eye of a Norman sage teaching at a rural school of magic. Realizing that the boy had promise, Durwin was made stable boy, and eventually allowed to attend classes. Now twenty, Durwin is proficient enough that he is assigned to teach, but the other sages refuse to promote him and he is hassled by the Norman juniors for his disability. But those troubles turn out to be the least of his worries when he manages to corrects errors in an ancient corrupted spell, which promptly prophesies murder. Sure enough, word soon reaches the school that one of the local count’s house sage has died, perhaps slain by black magic. Durwin is whisked away to the family’s castle, only to find that one death was only the beginning. The young sage quickly learns of a dizzying plot to assassinate King Henry. Dropped into the middle of the complex politics of England’s royal courts, can Durwin stop them in time? I found this surprisingly enjoyable. It’s much more a mystery than anything else, so it’s not action packed, but it kept me interested and I really enjoyed Durwin and William. I’ll admit that I found William’s quick capitulation a tad hard to believe and, considering how much Durwin seemed to be discriminated against, he faced very little notable resistance. Plus, he’s just a bit too good at everything. But I liked the writing, the magic system and the plot. All in all, I just plain had fun with it and look forward to more. This entry was posted in books/book review and tagged book review, fantasy, historical fiction on March 6, 2018 by Sadie.